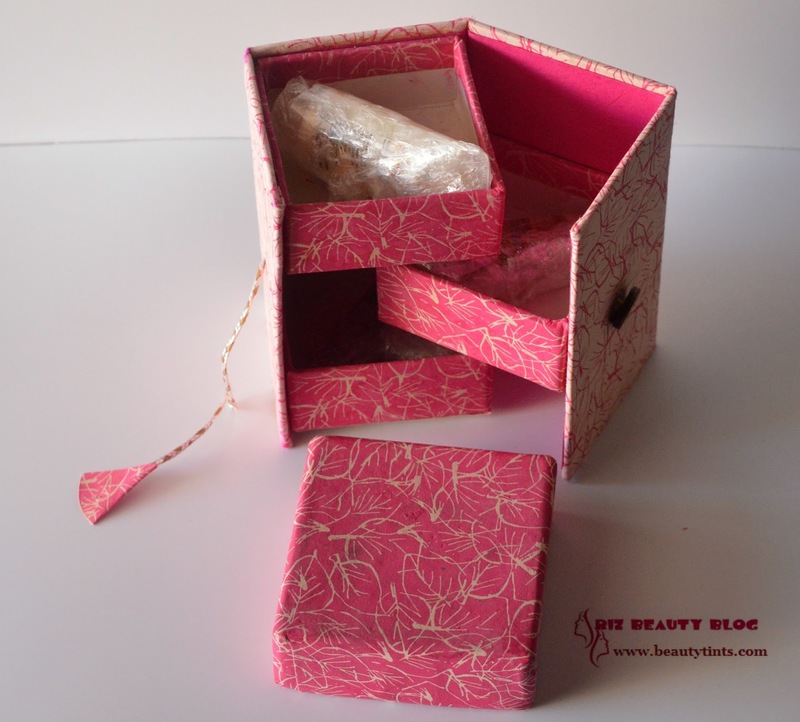 Sriz Beauty Blog: The Nature's Co February 2016 Blossom Up Beauty Wish Box Review!!! 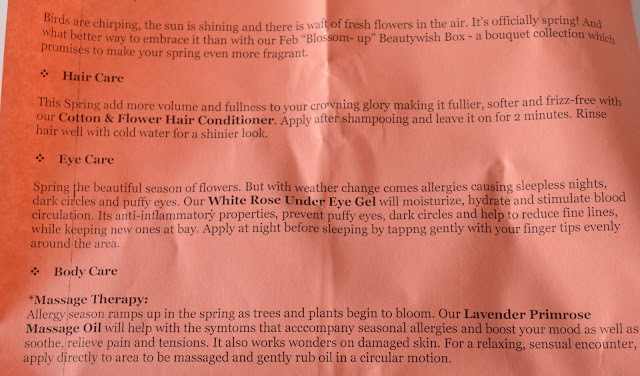 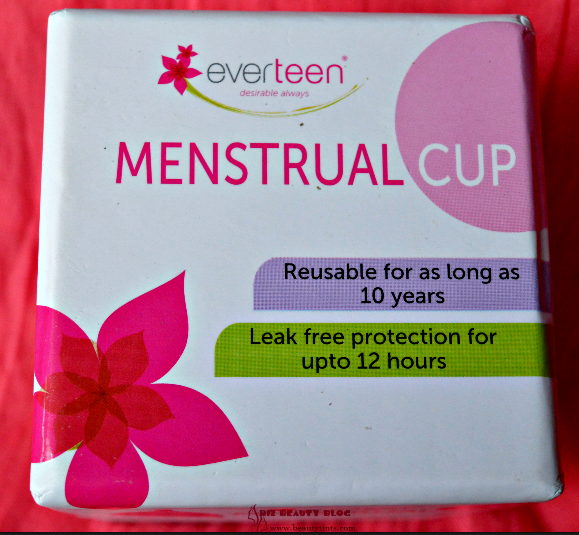 The Nature's Co February 2016 Blossom Up Beauty Wish Box Review!!! 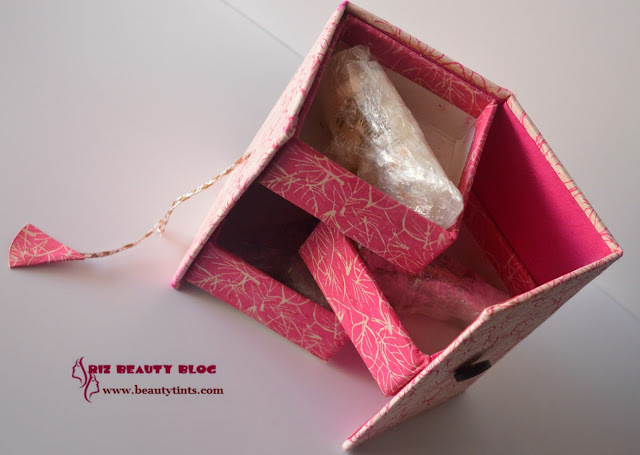 Today I am super excited to review this month's The Nature's Co Blossom Up Beauty Wish Box,which I received few hours back.If you have been following me on Instagram and snapchat (sriramani7),you would have already seen a sneak peak of it!!! 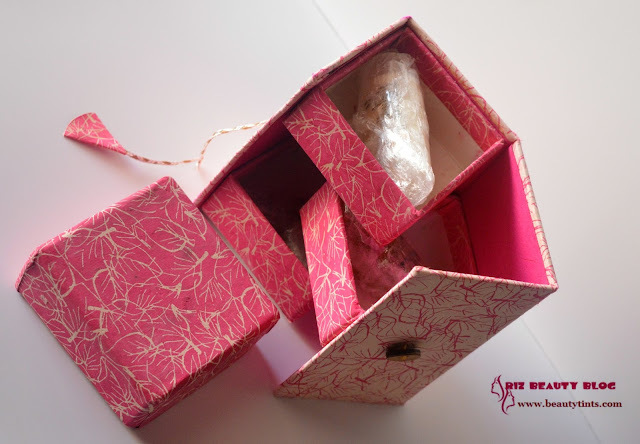 This month's theme is 'Blossom Up',where all the samples in it are floral based and this time I got instantly attracted with this cute Cupboard organizer,when they revealed the packaging a few days back and I ordered it immediately! 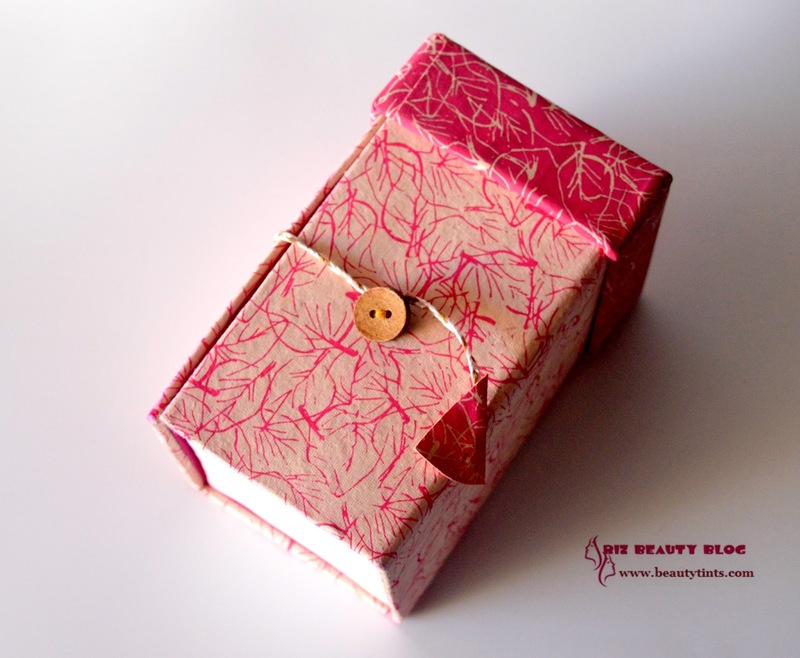 This is a pink colored cute hard card board organizer with leaf print all over and it has got 3 sections in it.It is a bit small but I loved it.I am going to store my rings and studs in it! 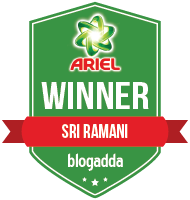 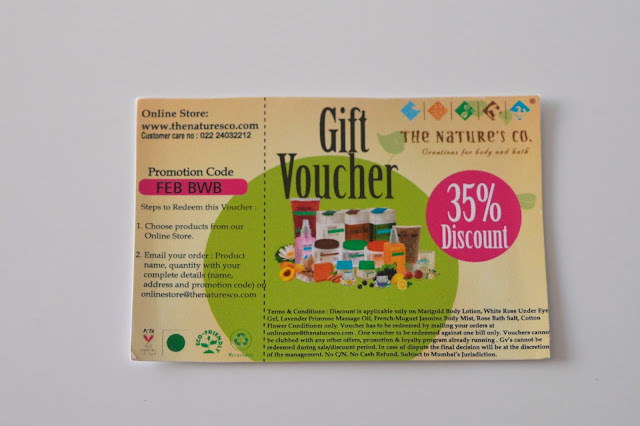 This time I received 5 Samples along with a Full sized product,bonus product and 35% discount voucher. 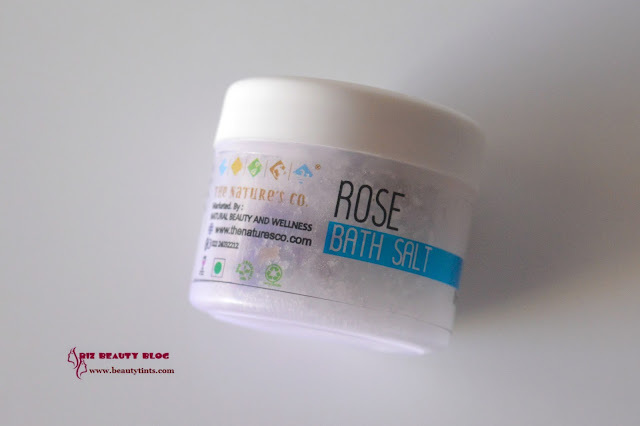 1) Rose Bath Salt (35 gm): I love bath salts especially floral scented ones.This Rose Bath Salt smells amazing and I have a full sized one already which I am going to review soon!!! 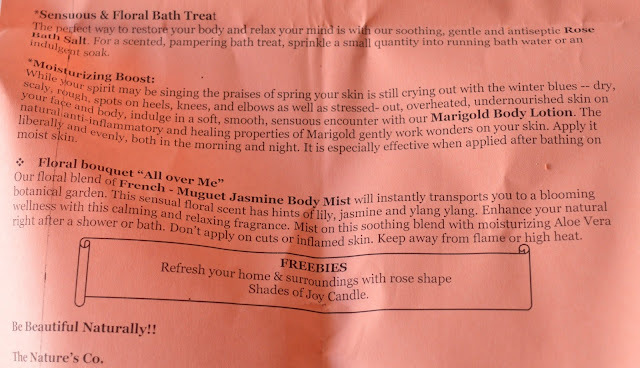 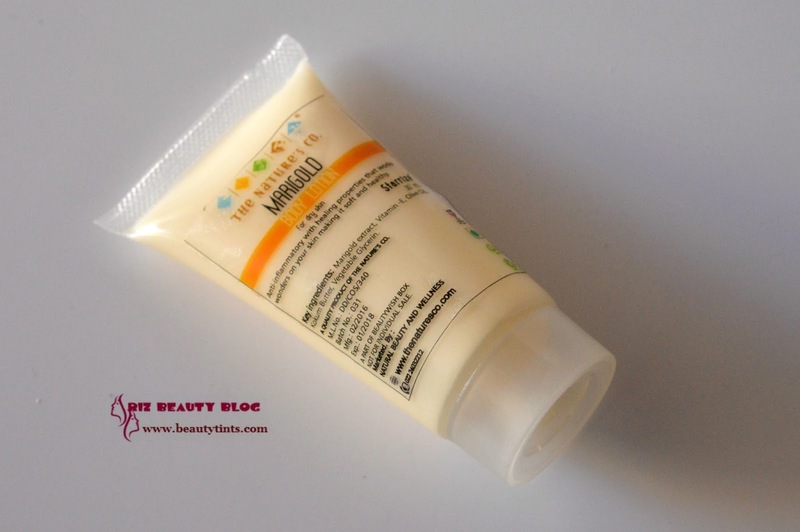 2)Marigold Body Lotion (30 ml) : I have tried this before and it smells good and hydrates well. 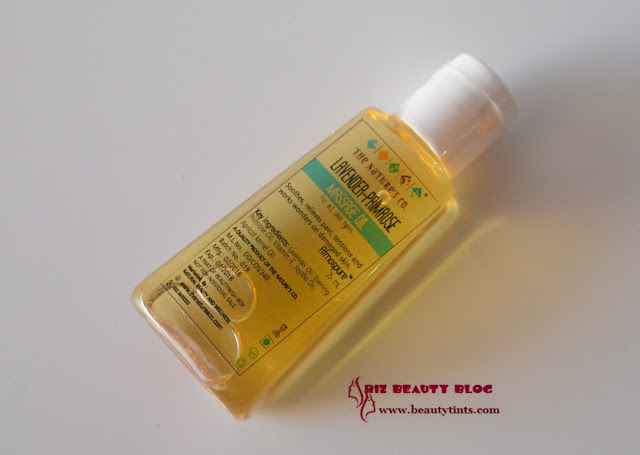 3)Lavender Primrose Massage oil(25 ml) : I love massage oils as they give a nice relaxation to the body and mind.I love this oil and it has a very soothing fragrance . 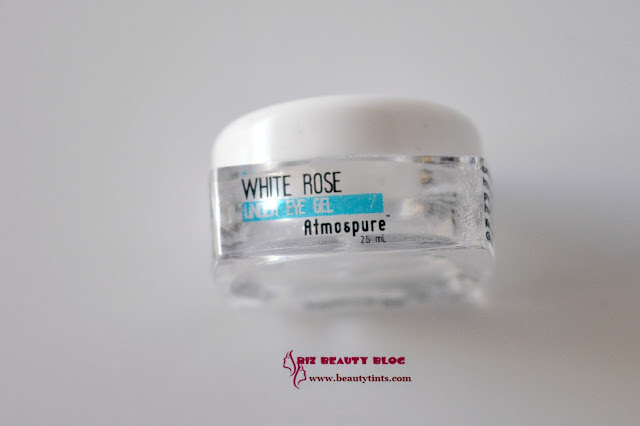 4)White Rose Under Eye Gel(2.5 ml) : I love this product and I am super happy to receive this again.May be this time I will purchase a full sized one!!! 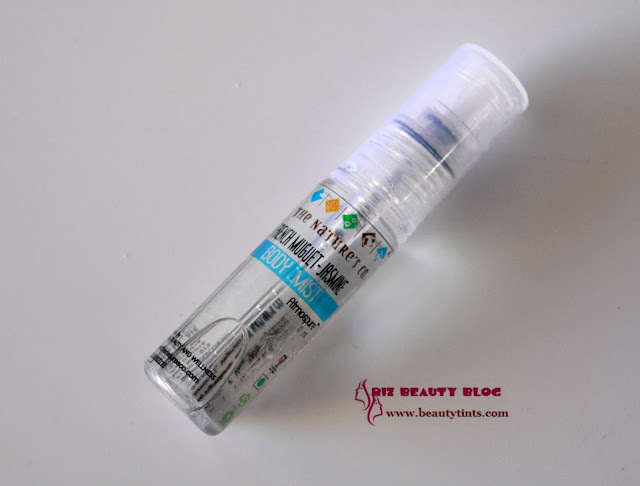 5) French Muguet - Jasmine Body mist (10 ml) : A lovely sensuous fragrance which lingers for a long time,a must product for this love month. 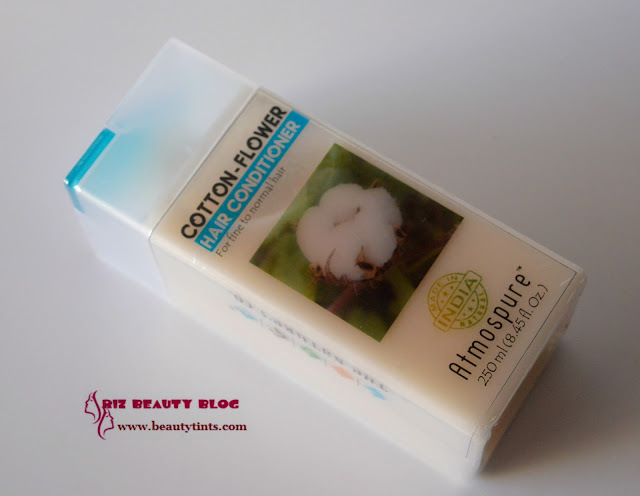 6)Cotton Flower Hair Conditioner Full Size (250 ml) : I am double happy to receive this as I haven't use this before and not only ...Its a FULL SIZED bottle!!! 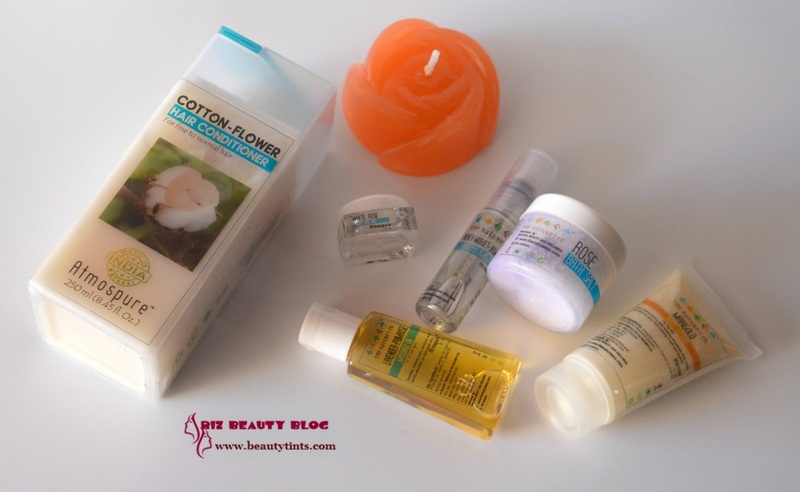 7) Shades Of Joy Rose flower shaped scented candle : This smells absolutely amazing!!! 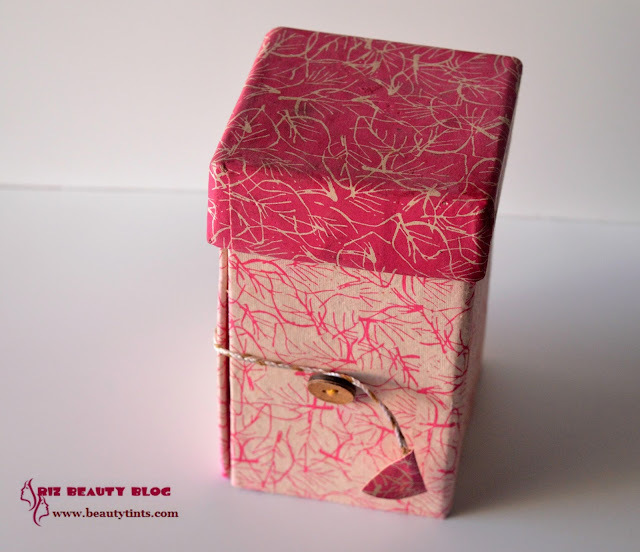 The sweet scent of this candle instantly cools and relaxes the mind.A perfect choice to gift our loved ones!!! 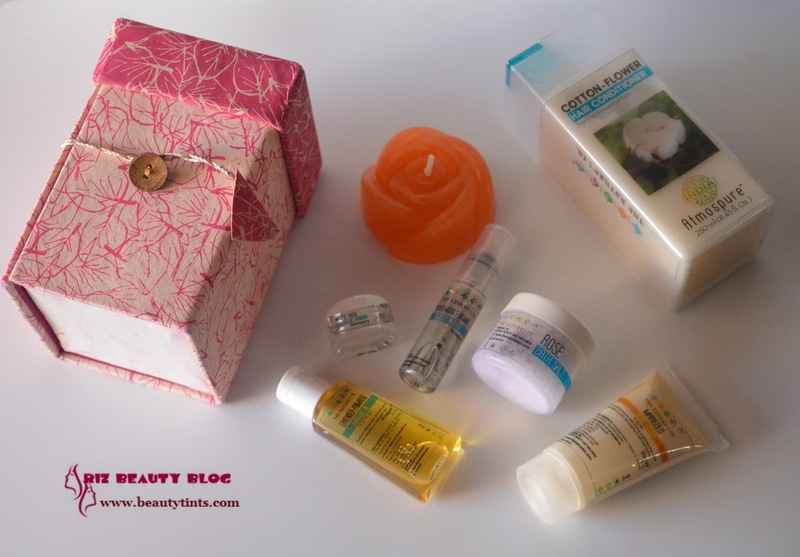 So,these are products in this month's beauty wish box!!! 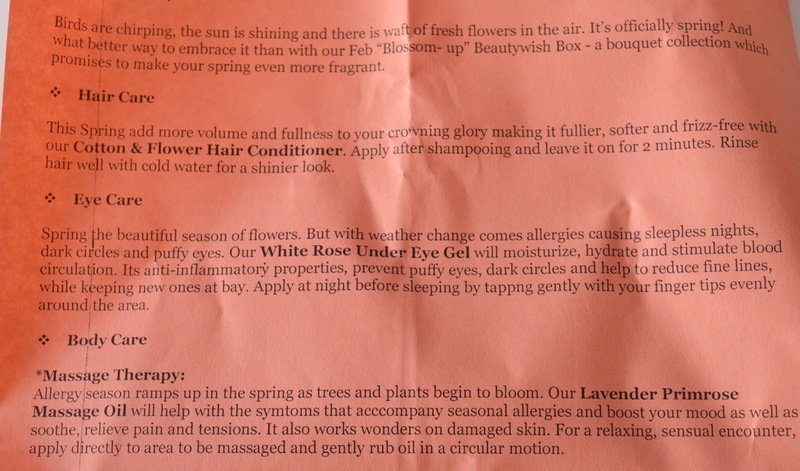 Final Thoughts about The Nature's Co February 2016 Blossom Up Beauty Wish Box: I am loving the retail sized product each time,as it gives us a chance to try the products for longer time and help us know how it actually works,which is the actual purpose of these subscription boxes.Loved each and every product from this box along with the cute little cupboard organizer.